Day 4 of Week of Wings. It’s time to visit the grocery store to see what the wing sauces on the shelves offer. Today it’s three styles of Sweet Baby Ray’s wing sauces in the spotlight. Week of Wings 5 – Day 4. 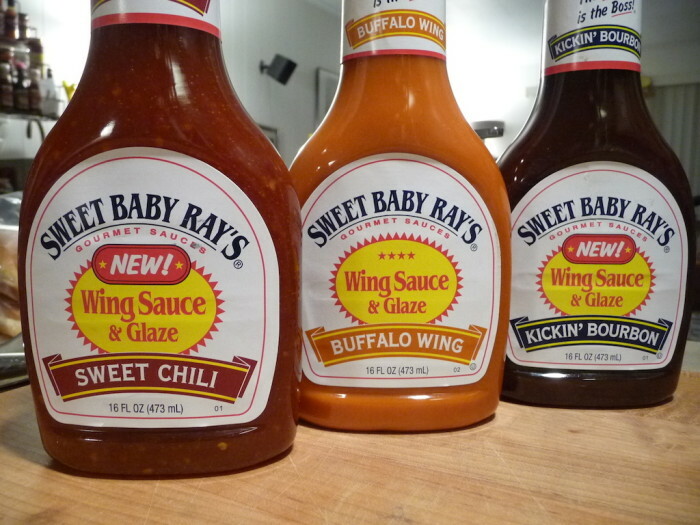 Our featured wings today are a 3 way from Sweet Baby Ray’s. 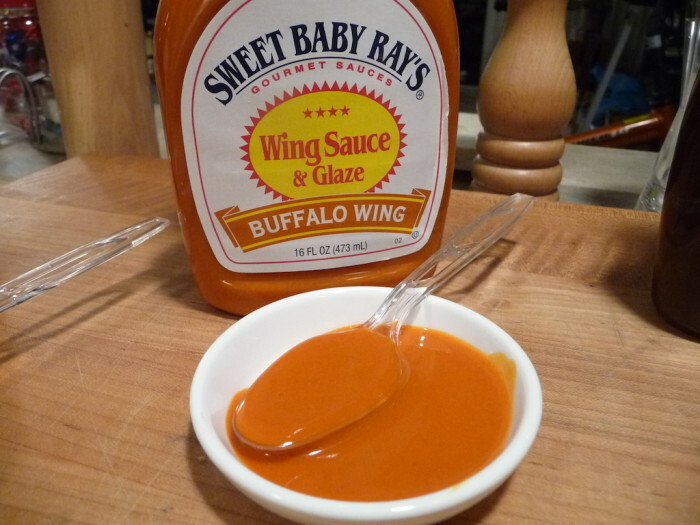 Sweet Chili Wing Sauce and Glaze, Buffalo Wing Sauce and Glaze, and Kickin’ Bourbon Wing Sauce and Glaze. All are easily found on your local grocer’s shelves. 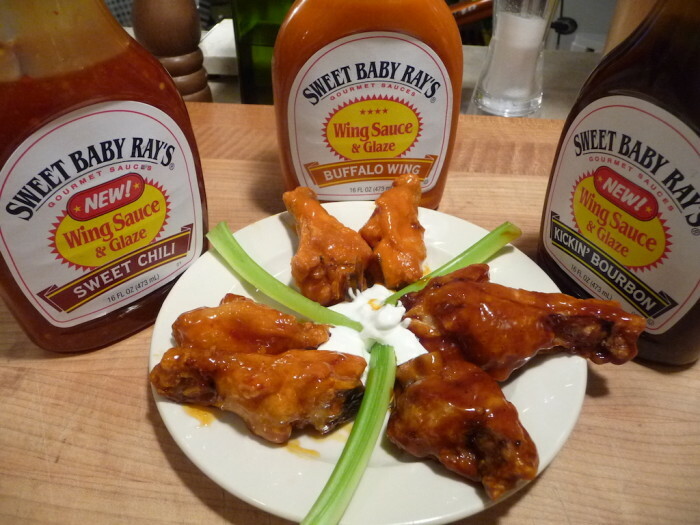 We like Sweet Baby Ray’s BBQ sauces – who doesn’t? I would venture to say they are probably America’s favorite store-bought sauces. But how do their wing sauces hold up? “The Sauce is The Boss” as they say. Preparation: Deep fried. Again, we did our usual 3 step cook – baked at 350º for 40 minutes (turning once half-way through), deep fried at 350 – 375º for 2 – 3 minutes, then tossed in the sauce. See our Wings 101 post for more info. 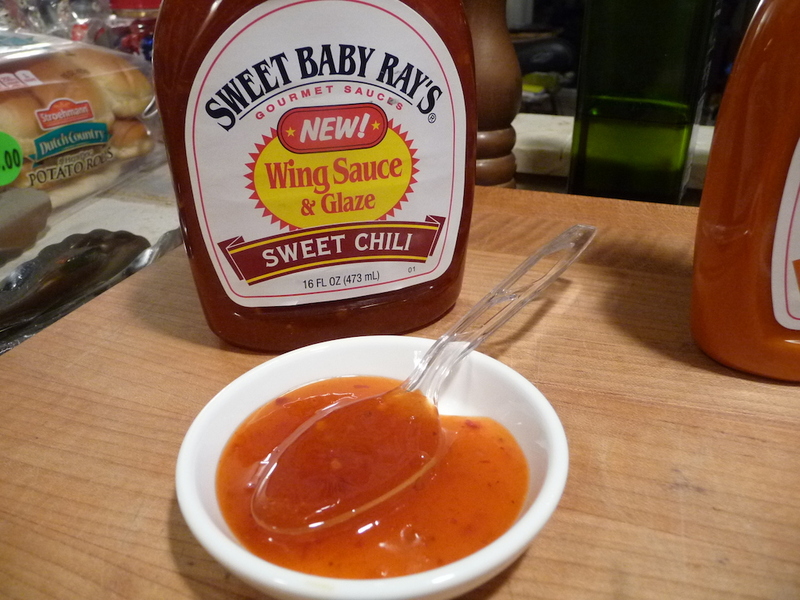 First up, is their Sweet Chili sauce. This sauce starts off sweet, but spicy red chili peppers provide enough heat to fire up an order of wings or liven up grilled salmon, popcorn shrimp, or pork chips. Ingredients: high fructose corn syrup, distilled vinegar, aged cayenne pepper, water, modified food starch, salt, sugar, contains less than 2% of: sriracha chile sauce, red bell pepper, garlic, wheat, soybeans, vegetable oil, chicken base, spice, chile de arbol pepper, potassium sorbate, sodium benzoate, sodium metabisulfite as preservatives, xanthan gum, paprika. Texture and Appearance: Typical thick and sticky chile sauce, with bits of ingredients floating about. Clean. Taste on wings: Super sweet and very sticky. Finger licking goodness with just a touch of heat. Enjoyable. Heat Level: ★☆☆☆☆. Just a tingle of heat. Ultra mild. Satisfaction: ★☆☆☆☆ – 1 Star – We think these wings are “acceptable”. And we think this sauce would make a great crockpot full of meatballs (which we plan to try), or added to baked beans, or as a glaze on ham or pork. Next up, their version of Buffalo Wing Sauce. 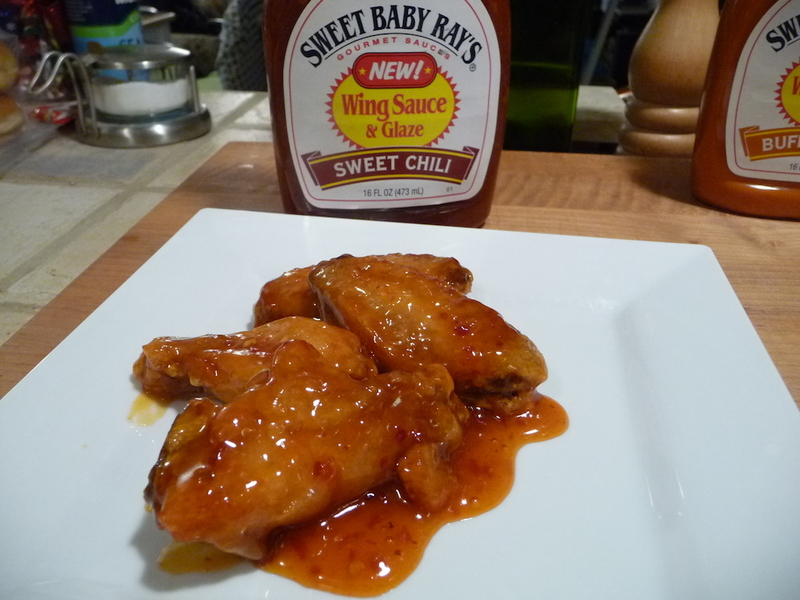 … full flavored sauce with the perfect blend of cayenne pepper and garlic, and a rich butter finish. Ingredients: aged cayenne pepper, distilled vinegar, margarine, water, salt, dried garlic, contains less than 2% of: vegetable oil, paprika, xanthan gum, propylene glycol alginate, citric acid. Gluten free. Texture and Appearance: Thin and bright orange in color. 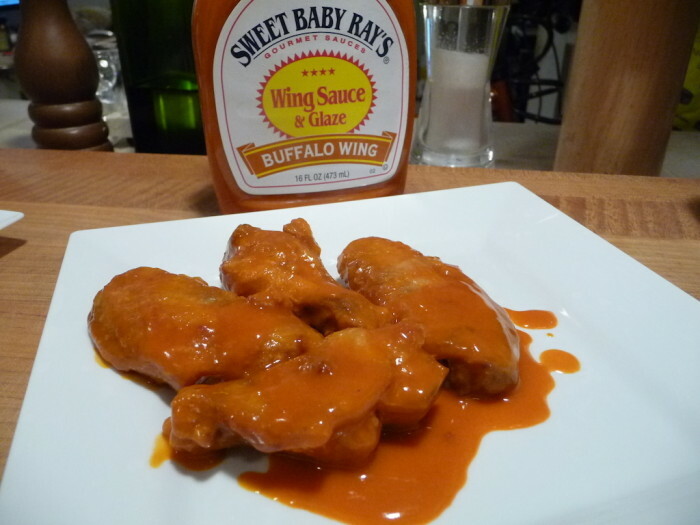 We’re back to the typical “buffalo style” bottled sauce look here. Moderately clingy and sets up on the wings. Great cling factor. 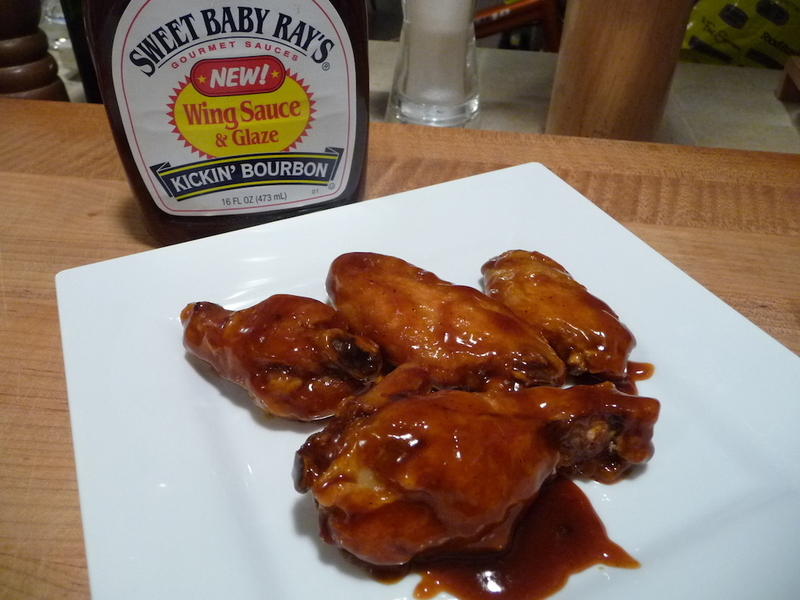 Taste on wings: This has all the taste of a very traditional wing from your local bar. Not a lot of butter taste, and the vinegar flavor is very mild. The taste is average, and the heat only slightly hotter than other bottled sauces from the store. Tangy. Heat Level: ★☆☆☆☆ Hotter than some store sauces, but only at a bare minimum. Would make for an acceptable wing that everyone could enjoy. Nice quality of flavor. Reliable. Satisfaction: ★★☆☆☆ – 2 Stars – Nothing wrong with these mild wings. They’re just what you would imagine from a bar with a decent mild wing. Average. 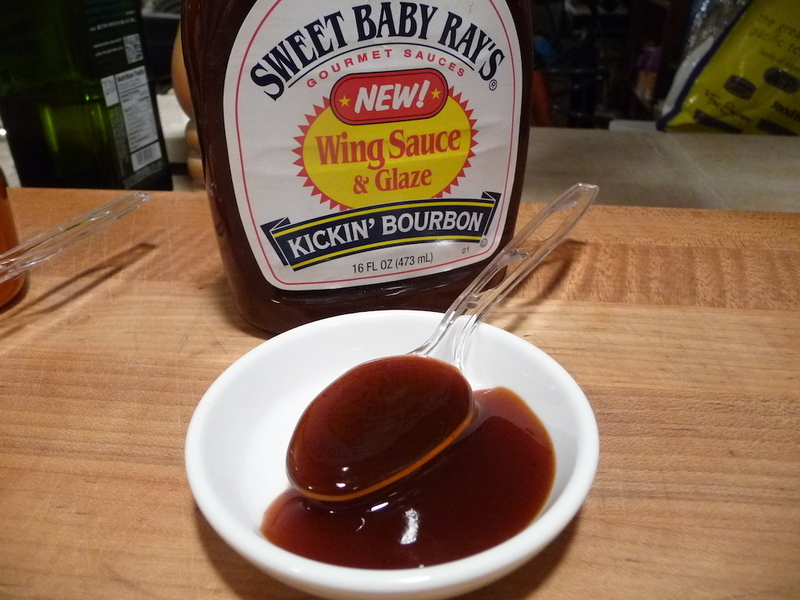 Finally, the BBQ version of their wing sauce. Ingredients: water, high fructose corn syrup, aged cayenne pepper, molasses, distilled vinegar, modified food starch, salt, contains less than 2% of: bourbon, dried garlic, chipotle pepper, spice, natural flavor, potassium sorbate and sodium benzoate as preservatives, xanthan gum, tomato paste, paprika, sucralose, citric acid, sodium citrate. Texture and Appearance: Dark almost mahogany colored. This mildly thick sauce is the BBQ Wing sauce king of the bunch. It clings nicely to the wings. Classic bbq. Taste on wings: This is a BBQ wing. Make no mistake about it. Superior to your average bar bbq wing, these are very satisfying and tasty. Winner. Heat Level: ★★☆☆☆ – 2 stars – Heat is just under medium here. This is all about the BBQ wing. Classy. Satisfaction: ★★★☆☆ – 3 stars – Almost tops on our preference for a bbq wing. Delicious and savory. Preferred.